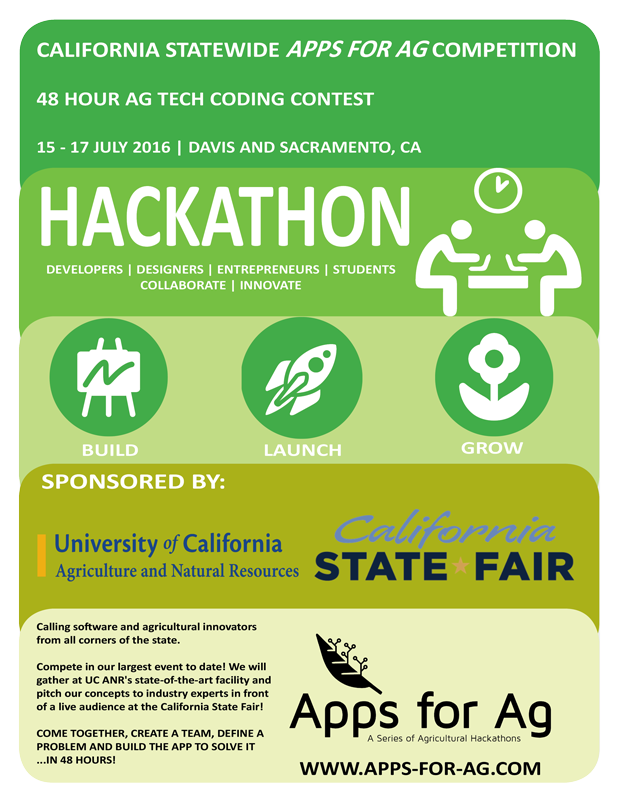 Ag-themed Hackathon coming to UC ANR, Spread the Word! Something very exciting is coming to UC ANR this July. The Apps for Ag Statewide Hackathon, hosted by UC ANR and the California State Fair, is bringing together coders, designers, entrepreneurs, farmers and students to engage in collaborative computer programming to improve agriculture. Starting in the morning of July 15, and continuing over the course of the next 48 hours, both newcomers and veterans will team up to transform their brainstorms into reality. This unique design-and-development competitive Hackathon is meant to solve on-farm problems in agriculture and food. Participants will compete for cash prizes at a “pitchfest” in front of a live audience at the California State Fair on Sunday, July 17, from 1 p.m. to 3 p.m. Prizes will be awarded to the top three apps: first place wins $5,000, second place $3,000 and third place $1,500. Sponsors include the University of California and Cisco Systems. The event is the fourth in a series organized by the AgTech Roundtable, whose members include U.S. Department of Agriculture, California Department of Food and Agriculture, California Department of Technology, California Farm Bureau Federation, California Association of Pest Control Advisers and many other organizations. Does this sound like something you might want to attend in some capacity? And please help us spread the word about the Hackathon among your friends, colleagues and students. The more participants we can gather, with diverse skills and representing all corners of the state, the better our chances of developing truly innovative solutions to challenges of agriculture today. More information and the registration page can be found at www.apps-for-ag.com. Don't hesitate to reach out to us with any questions you have or to let us know of your interest in participating. Sounds like it will be great event. Wish I was closer.